Advantage II is a fast topical flea control for dogs that kills all life stages of fleas. Fleas are killed within 12 hours. The first active ingredient is imidacloprid, which acts on the nervous system of the flea to cause paralysis and subsequent death. To protect against further infestations, reinfesting fleas are killed within 2 hours. The second active ingredient, pyriproxyfen, is an insect growth regulator. Once a female flea lays her eggs, pyriproxyfen works to prevent the eggs from hatching, ending the flea life cycle. 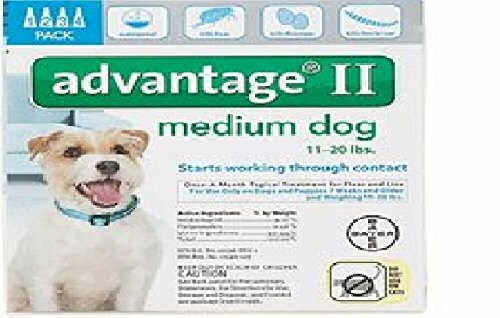 Advantage II kills fleas through contact, so they do not have to bite to die. One convenient waterproof application of Advantage II lasts up to 1 month. For use on dogs and puppies 7 weeks and older. Package includes 4 tubes with 1.0ml each. Do not contaminate water, food or feed by storage or disposal. Store in a cool, dry place. USE ONLY ON DOGS. Advantage Flea Control is a monthly application that kills 98% to 100% of fleas and their larvae within 12 hours. In addition re-infesting fleas are killed within 2 hours. Kills fleas before they have the chance to lay eggs - thus breaking the flea life cycle. Effective up to 6 weeks!Advantage is applied to the back of the neck on cats and between the shoulder blades on dogs. It spreads naturally on the skin surface at the hair root level aided by body movement to provide whole body coverage. Advantage is water-resistant flea medication so it continues to kill fleas even after shampooing swimming rain or exposure to sunlight. Advantage is for dogs over 7 weeks old. Do not use dog products on cats or cat products on dogs.